A German company is offering an unusual form of residential energy storage. The Home Power Solution hybrid storage unit that combines batteries with fuel cells. A German firm is aiming to help homes obtain year-round self-produced renewable energy with a hybrid storage system combining batteries with hydrogen. 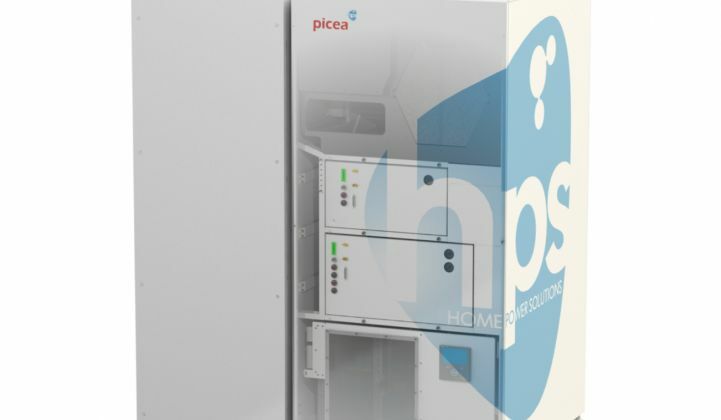 Zeyad Abul-Ella, managing director and founder of Berlin-based Home Power Solutions (HPS), said his company’s Picea all-in-one unit, which went on sale this month, “has a hundred times more storage capacity with twice the output” of competing systems. The system delivers solar-powered heating and ventilation as well as electricity, the company said. It comes with a guarantee that customers can service 100 percent of their own energy requirements from their own solar panels, which are not included. Under the hood, the Picea system contains lead-gel batteries and a fuel cell, electrolyzer, solar charge controller, inverter, hydrogen tank, heat exchanger and storage, ventilation unit and energy management system. It has a peak electrical output of 20 kilowatts, a continuous power rating of 8 kilowatts, and can store energy for thermal, daily and seasonal use, according to a product data sheet. The daily storage capacity amounts to 25 kilowatt-hours. The Picea’s thermal storage tank, meanwhile, can deliver up to 45 kilowatt-hours, with 350 kilowatt-hours to 1 megawatt-hour of seasonal storage capacity, presumably delivered through hydrogen. The technology mix is designed to allow the Picea to keep a household running off solar and battery storage in summer, while storing up enough hydrogen to cover energy use over the winter. Overall, the system, which will start shipping in the fourth quarter of 2018, is expected to deliver between 3 and 6 megawatt-hours of energy a year. This should be enough to satisfy the needs of a four-person German household, which the German Federal Environmental Agency calculates would use around 4 megawatt-hours a year, according to HPS. Abul-Ella said the first 50 Piceas were being sold for €54,000 ($66,550), excluding sales tax. Installation costs “will be charged separately by the distribution partners, in line with usual practice,” Abul-Ella said. Given that the German Association of Energy and Water Industries says a typical three-person home in Germany now spends €85.80 ($105.70) a month on energy, that means a payback period of more than 50 years. Given this, the big challenge for HPS will be to drive down costs as quickly as possible. But this will likely depend on economies of scale that might be hard to achieve without lower costs, leading to a Catch-22. HPS’ chances aren’t helped by the fact that it is operating in what is possibly the most competitive residential solar-plus-storage market anywhere. 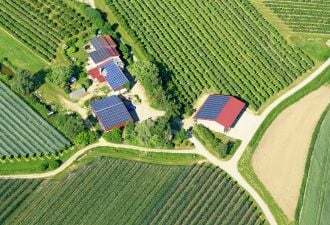 “Germany’s residential storage market is one of the strongest and most developed in the world and has seen substantial activity in the last few years, thanks to expiring solar feed-in tariffs and high electricity prices,” Simon said. GTM Research forecasts Germany’s residential storage market could hit 161 megawatts of installations annually this year, more than twice that of the whole of the U.S.
On one hand, this could benefit a company such as HPS because German consumers are more likely to be comfortable with buying into novel solar-plus-storage products. On the other, customers are likely to be dazzled by an array of much cheaper storage offers from battery manufacturers. And those interested in the heating portion of the Picea have options, too. The heating and refrigeration equipment manufacturer Viessmann, for example, has a product called the Vitovalor 300-P that uses a fuel cell to deliver power and heat from hydrogen. The technology was “especially developed for detached and two-family houses,” the company says.